More than 8,000 international visitors are expected to participate in Smart Dubai’s upcoming Future Blockchain Summit, the world’s most influential blockchain event, in Dubai, UAE. The second edition of the event will take place on April 2 and 3 at the Dubai World Trade Centre (DWTC). Future Blockchain Summit 2019 will shine the spotlight on excelling blockchain technologies, moving conversation beyond theoretical use-cases and into real-life opportunities. It will look at blockchain use across the world’s most integral industries, including retail and ecommerce, healthcare, transportation, education, food, hospitality and tourism, energy, fintech and banking, safety and security. The event will host speakers from world-renowned brands like Coca-Cola, Tencent, Johnson & Johnson, Maersk, HSBC, eBay and Lufthansa. Government entities including du, Dubai Land Department and Dubai Health Authority will all be on-hand to showcase their advancements and use cases in the revolutionary technology. “We are already seeing a multitude of ways in which blockchain can transform a community,” said Dr Aisha Bint Butti Bin Bishr, director general, Smart Dubai Office. “Smart Dubai has been working on over 20 citywide blockchain use cases in partnership with the government and private sector, and we will see many more in the months and years to come. At the heart of this year’s Summit will be the PwC Middle East-backed Global Leaders Exchange – a closed door, round-table discussion where senior government and business officials will work to catalyse blockchain use by focusing on two central themes: establishing policy for blockchain implementation, and positioning crypto-assets in a time of market turbulence. “Dubai is leading the way forward in its ambition to become the first blockchain-powered government, with vision and leadership to pioneer the use of the technology and provide governance within key industry verticals such as real estate, financial services and healthcare. “Our new report, which will launch ahead of the Future Blockchain Summit in April, draws a roadmap for organisations that are seeking to make use of this technology and make the transition from proof of concept projects to implementation,” he added. At 2018’s debut Future Blockchain Summit, 76 per cent of visitors admitted attending with the sole purpose of trying to understand what blockchain is. This year, over140 hours of speaker sessions will seek to demystify and unpack the technology – all in the presence of more than 80exhibiting startups and established businesses, and experts from no fewer than 130 countries. Globally, the blockchain market is set to shoot to a value of $60billion by 2024, up from $708million in 2017. Already, blockchain technology has transformed the financial industry with the incredible success of cryptocurrencies in recent years. Healthcare, real estate and energy industries are also reporting success with the implementation of blockchain technology. The Summit will have no less than six live conference and seminar stages, which will be home to many of the most talked about names in technology. The event’s new BlockBASIC Asia Forum – held in partnership with Camelot International Conferences – will shine a light on Asia’s prominent journey in early blockchain adoption, with the continent already established as a standard-setting incubator for innovation. The Forum will seek to connect Asia-based entrepreneurs and investors over truly ground-breaking blockchain innovations. 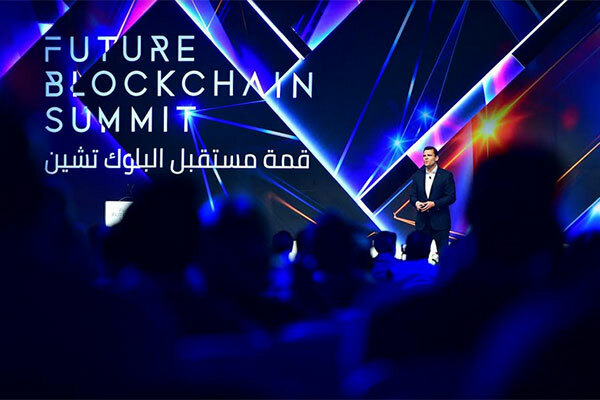 Smart Dubai, in partnership with Dubai Future Accelerators, will use the 2019 Future Blockchain Summit to launch the third round of the Global Blockchain Challenge. The challenge will see startups from around the world pitch projects that can contribute to the goals of the Dubai Blockchain Strategy - aimed at eliminating 100 million paper transactions-a-year, saving $1.5billion – and make Dubai the first blockchain-powered city by 2020. The show will also host the BlockHealth Summit, organised by the Patientory Association, which will lead the discussion on blockchain adoption in the healthcare industry. In a world first, Future Blockchain Summit 2019 will have the industry’s debut gamified and tokenized blockchain event – the ‘City of the Future’ Experience, powered by du. It will also have an investor programme aimed at supersizing startup funds, allowing startups to break the ice with big-ticket investors; a Blockchain Networking platform; and swathes of live performances, case studies, demo showcases and product launches. Trixie LohMirmand, senior vice president, Exhibitions & Events Management, Dubai World Trade Centre, said: “Last year’s Future Blockchain Summit lit a spark in Dubai’s technology community that has spread throughout the world. We saw launches, speakers making their regional debut and thousands of like-minded first-movers coming together to shape the future of blockchain.